In modern life, one of the things we don’t do much of is eat real cultured and fermented foods. For thousands of years, these foods have been staples of the human diet. Since the Industrial Revolution when the advent of packaging, processing, and convenience foods began to occur, we seen the disappearance of these highly beneficial, nutrient-dense foods which were consumed by our ancestors, all over the planet for thousands upon thousands of years. Throughout time, people have cultivated these beautiful, cultured foods and beverages out of necessity. When a dairy cow produced a surplus of milk and all of it could not be consumed at once before spoilage, fermentation was born. Fermentation allowed the food to be preserved so it could be consumed later, and it was done simply by using the naturally-occurring healthy bacteria in the food. Because the process of fermentation improves nutrient content and increases the beneficial bacteria of the food, it is nade easier to digest, which makes the food healthier. Other foods were produced in a similar manner such as kombucha (a fermented tea generated from a SCOBY mushroom (symbiotic culture of yeast and bacteria) or kvass using vegetables, water, and salt. Kvass is a beverage created using vegetables such as beets, cabbage, carrots, and others. It was also customary in various regions to culture and ferment many of the vegetables people ate through lacto-fermentation which uses whey protein from dairy products and/or salt. Today on the modern consumer market, you will find products with labels which claim that the food you hold in your hand is health-providing and is full of nutrients. Because the bottom line in the consumer market is profit, over time the nutritional integrity of many traditional foods once consumed by a majority of our population has been compromised or completely lost. Commercial dairy and other products including vegetables contained in jars are subject to pasteurization and other processing. Pasteurization destroys and denatures probiotics, fats, proteins, enzymes, and other elements critical to creating real probiotic foods. Although commercial companies add back in cultures to food after pasteurization, the culturing process simply isn’t long enough to generate the diversity and numbers of beneficial bacteria which our bodies need. By the time you open a bottle, package, or container from the store, you are consuming a product that is definitely lacking in the type and numbers of live nutrients, enzymes, and probiotics or beneficial enzymes necessary to support optimal health. Sports and energy drinks like Gatorade, Vitamin Water, Red Bull, and Rockstar rely on caffeine, sugar, chemicals, artificial colors and flavorings to sell their product and make it “taste” appealing. Even higher-priced “professional” grade products such as Heed or Accelerade which contain synthetic vitamins and minerals or herbal ingredients are inferior because they lack real nutrition found in raw, long-fermented foods and beverages. Many probiotic supplements, except for certain products produced by mindful companie,s do not contain the bacterial count listed on the label. Many probiotics also contain other undesirable ingredients which can be harmful to health. Salt or a brine made with salt for culturing vegetables. Improves or eliminates gastrointestinal issues such as heartburn, bloating, gas, abdominal cramping, diarrhea, and constipation by eating a small serving with each meal. Your overall diet, should of course exclude processed foods and incorporate real, whole foods with healthy fats and proteins, organic fruits, grains, legumes, and vegetables. Processed foods eaten on a regular greatly contribute to digestive problems and other health issues. Deepens and broadens the value of vitamins and nutrients including magnesium, calcium, zinc, iron, B Vitamins, fat-soluble vitamins A, D, E, and K2, K1, and beta carotene. Fermented dairy imparts increased amounts of folate, pyroxidine, B vitamins, riboflavin and biotin, depending upon existing bacterial strains. 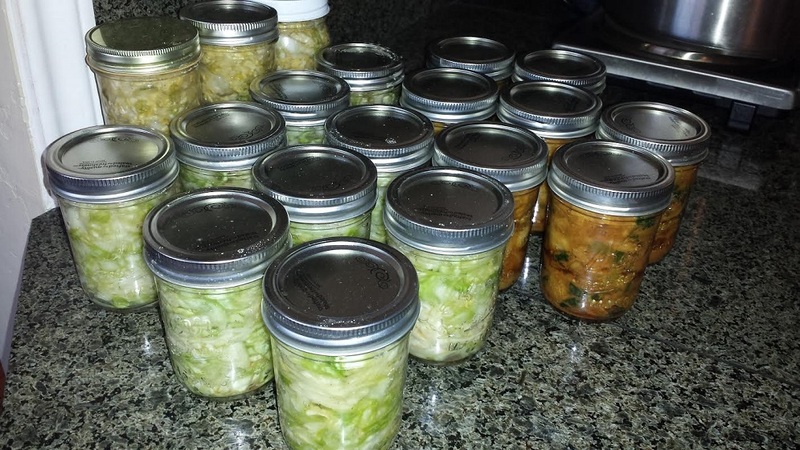 Raw fermented vegetables are useful in reducing inflammation and lowering the risk of degenerative disease like cancer. Strengthens immune system function to stay healthy and avoid flu and colds. Promotes weight loss. In a study from 2008 at Stanford University, Dr. John Morton, M.D., associate professor of surgery at the medical school, showed that “patients who take probiotics after the gastric-bypass procedure tend to shed more pounds than those who don’t take the supplements.” Since supplements are usually much lower in bacterial counts than live cultured and fermented foods, it would be easy to conclude that higher bacterial counts would promote weight loss and the ability of the body to balance your normal weight. Provides probiotic support to the digestive system. 85 percent of our immune system is located in the digestive tract, and having a proliferation and diversity of friendly bacteria is critical to immune health. Read more about how probiotics from foods and supplements can help overcome digestive disorders from The Weston A. Price Foundation. Although lactic acid fermentation does not necessarily raise mineral content, it lowers the effects of phytic acid found in grains, legumes, and vegetables. Phytic acid is a nutrient inhibitor which prevents absorption of minerals in the body. This process allows the body to absorb more minerals from grains, vegetables, and legumes. Dr. Natasha Campbell McBride who developed the GAPS diet, talks about the benefits of fermented foods in her book, Gut and Psychology Syndrome, recommended via Amazon affiliation. I embarked on GAPS in early May of 2011 and spent two years on the diet. I found marked improvement in my health, as well as disappearance of chronic anxiety and panic-symptoms. Read my article about how I eliminated panic, anxiety, and sleep disorder symptoms I experienced for over 20 years with GAPS. With a few exceptions, most commercial products are pasteurized which destroys enzymes, proteins, fats, and probiotics. Many commercial products are not cultured long enough to produce a proliferation or diversity of necessary beneficial bacteria for optimal health. Read more about the dangers of this product from Fooducate. Cultured dairy foods you make at home from raw milk that comes from healthy cows or goats on pasture are superior in every way in terms of quality and amount of diverse bacteria produced which our bodies need to support digestive, immune, and overall health. If you have sensitivities to dairy which can be caused by digestive compromise from poor lifestyle and diet, there are a variety of cultured and fermented foods which are highly beneficial in the process of healing the digestive tract. See the section below on cultured, dairy-free foods and beverages. Consuming these foods can be useful in helping you to heal gut lining, and once again be able to digest real, raw dairy foods. Casein, a protein found in dairy, can irritate the digestive tract lining which has been compromised from poor diet and lifestyle, and which then penetrates the walls of the intestinal lining and enter the bloodstream to cause super-immune response. This response can manifest in a variety of symptoms including asthma, respiratory issues including colds and sinus infections, skin disorders such as eczema, chronic fatigue, and many other health issues. This is why some individuals have “dairy allergies” or sensitivities when consuming dairy products. Like commercial dairy products, most commercially produced sauerkraut, pickles, and other non-dairy foods you buy in the store have only been processed with vinegar as a base, are subjected to high-heat temperatures, and often contain toxic ingredients. Adding vinegar to the food does not create a culturing effect, and high heat and other ingredients destroys rather than keeps the integrity of beneficial enzymes, nutrients, and bacteria. Kombucha – highly recommended is Kombucha Kamp for all your kombucha-making needs. We have been making our own kombucha for 2 years and absolutely wouldn’t be without it! Be sure to sign up for Kombucha Kamp’s e-mail list. When you sign up, you’ll receive the DIY guide and e-book FREE! Japanese organic soy foods such as natto, miso, and tofu. Fermented soy is the only soy recommended for consumption. Read why soy can be harmful to health from the Weston A. Price Foundation. Here are some recommendations for buying culture starter for culturing your own vegetables as well as quality dairy cultures. There are a variety of health practitioners who recommend taking probiotic supplements in addition to eating fermented foods and beverages daily. The reason for this is due to the widespread nature of digestive disorders from a population which relies upon processed and toxic foods in its daily diet, as well as a toxic environment. Over years of time, poor lifestyle habits can cause marked degeneration in health and the digestive tract. Taking a quality probiotic supplement can aid in healing of the digestive tract and restoration of friendly bacterial balance to the immune and digestive environments, which have a positive effect on overall well-being.